If you’re looking for a suite that saves a lot of space in your bathroom then the soft gentle lines of the Affine Amelie Bathroom Suite are a perfect match. The modern square look and supreme quality is what makes it one of the most popular ranges on the market. Take the hassle out of your bathroom redesign with a gorgeously styled shower bath suite. It includes a stunning wash basin and toilet which have been cleverly paired with one of our extremely versatile P shaped shower baths. Smooth curves and hard corners make up the very contemporary look making them ideal for installation in any type of modern bathroom, small or large. Choosing materials for bathroom suites has never been that difficult for us. It needs to be hard-wearing, look great and importantly be easy to clean which perfectly sums up the Amelie P shaped shower bath suite. The toilet and basin are engineered from porcelain which is coated in a sublime vitreous china while the bath is made from acrylic so it’s strong while still saving on weight. Both materials are completely moisture proof and of course really easy to wipe down. 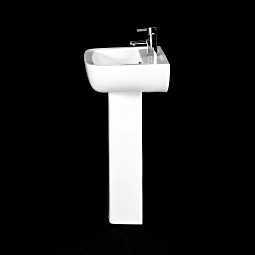 To ensure maximum compatibility with all bathroom designs the toilet, basin and bath are all finished in a crisp, clean white. The Amelie toilet is definitely no ordinary WC and has a number of tricks up its sleeve. For starters its incredible space-saving properties. It has all the seating space of a normal toilet but with a smaller footprint. “How?” you ask. Well with a smaller, smarter cistern it’s perfectly possible. It projects a shorter distance from the wall but still packs more than enough power to produce a powerful and effective flush. After all bathroom space is really valuable so why would you want to waste it? Talking of cisterns here’s a bit more information about the Amelie version; It functions with a sleek dual flush push button which is mounted discreetly to the cistern lid. This allows a choice of either a large 6 litre flush or a smaller 3 litre flush which (if you’re on a water meter) could save you some seriously hard cash. And let’s face it we all like to save a bit of money! No toilet seat is quite as comfortable as the one you’ve got at home which is why we ensure our seats are built to the highest standard so you can get years of use from them. The Amelie seat in particular features a brilliant soft close hinge which slower lowers the seat and lid until closed. This dramatically reduces noise, perfect for those late night toilet trips, and saves any little hands from being squashed. It has a sleek, wrap around design which blends perfectly into the rim of the pan and makes for easier cleaning. It is of course finished in white to complement the rest of the suite. Your bathroom wash basin is one of the most used appliances in the home so you need to make sure it’s good quality and aesthetically pleasing to look at. Fortunately the Amelie basin certainly covers these points with a gorgeous style and superior finish. It’s been designed with a standard mono basin mixer tap in mind and has a pre-drilled tap hole to fit it, the tap itself isn’t included but one can be found in our huge basin mixer taps range. Supporting the basin is the full pedestal. Full pedestals not only conceal any tap pipework but they add strength to the installation for a longer-lasting bathroom suite. Don’t fall out over your bathroom refit and make sure everyone’s happy with a gorgeous P shaped shower bath. You get the flexibility to choose whether you’d prefer a shower or a bath at any time so the only thing you’ll have to argue about is how long your significant other spends in there. The bath itself is made from sturdy acrylic which is not only durable but light to make installation easier. This is reinforced with fibreglass and left without tap holes so you can decided where they’re installed. A side panel and a shower screen are supplied as standard so you’ll have everything you need to create your perfect calming environment. After weeks of work finally Fitted my new basin and toilet. It's looking great, I am very pleased with the quality of the suite. I would recommend plumb world products. Easy to install, great on the eye and looks a lot more expensive than it actually is. Also bought a freestanding bath and it sets my bathroom off well. The Bathroom suite was excellent value and has greatly enhanced our bathroom. Excellent product, great look, very simple ordering and delivery. Items look good for the price. They arrived well packaged and and was delivered within the delivery time stated during purchase. This came very quickly, and looks great. Very modern contemporary feel. Really pleased with it. Excellent product , at a decent price. Looks pure class .